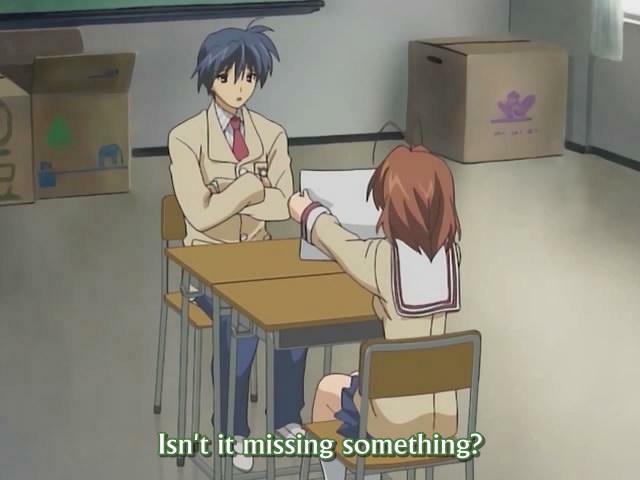 I think one of the main reasons why is that Tomoya and Nagisa actually have a relationship. They do meaningful things together. Their small talk has real back and forth, push and pull (not that kind–please :)) and they help each other out. 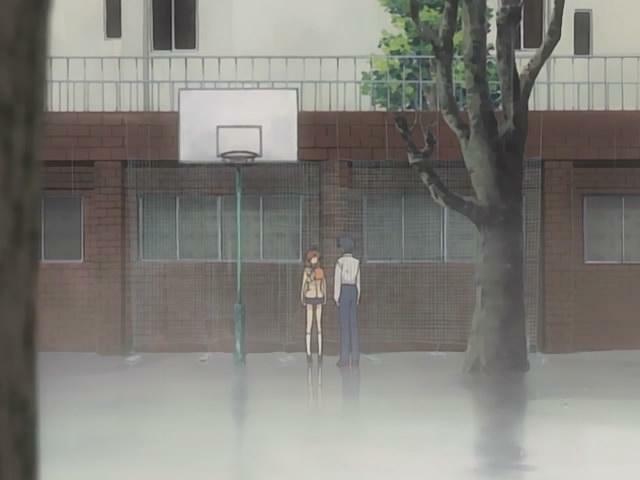 So many lesser anime romances are about one-sided relationships. It makes the more conventional moe traits of Nagisa–her voice, her affinity for Big Dango Family, etc.–much more palatable. I remember being annoyed by the “gao” and squeakiness of Misuzu in Air, and it ultimately blunted the force of the ending for me. She seemed more like an incoherent jumble of cute and quirky traits. So far, at least, Nagisa is a more credible character. Or maybe just emotionally more subdued. I don’t know. I have a bad habit of confusing emotional restraint with realism. I’ll end on a semi-personal note. I remember a number of years ago, when I was in the middle of rather deep funk of loneliness; it was sometime in the middle of undergraduate college. When I become especially depressed and lonely, I come up with stories and write, and I wrote the plans for an entire novel about a doomed relationship. One of the key early scenes in the novel was simple, and, to my mind, deeply romantic: the guy would be trying to get to his first date with the girl, but it would be raining hard as it often does on the East Coast during the summers, and there would be many obstacles on the way that would make him late. He would find his date standing out in the rain, with no umbrella, shivering in the cold. He would get out of the car, stand there for a moment as he realized that she had been waiting for him all this time, while getting soaked. Only then would he offer the umbrella and the two of them, their wet clothes pasted to their skins, would enter the restaurant together. 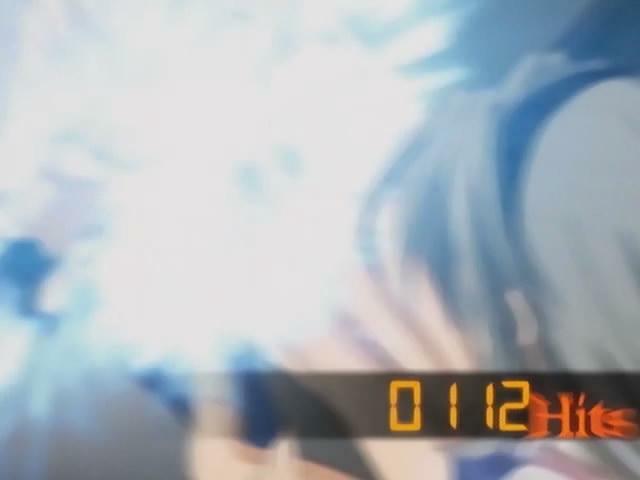 I couldn’t help but think of that scene, which I never wrote, as I watched the final moments of this episode. It stirred something within me, a twinge of memory that carried me back to those days. And as the closing credit song started, a song full of childish cuteness, it suddenly sounded terribly sad. And I knew from that point forward that I had been not only sucked into Key Land, the land of sad girls who say cute things as they die in snow, but that I figured out why this group of people at their best seem to touch so many fans. I may, in fact I probably am, projecting my own memories onto this scenario, and not even real memories but one of my fictions. I sometimes wonder if I wrote an anime or manga what kind of story I’d produce. It would probably not be exactly like this; it wouldn’t have a harem. But it would probably have scenes like this. In short, it shares my aesthetic tastes. That means it has to be good! The Key Borg Fairy is impelling me to blog about this show again, surely. That’s all I can ask a good new anime to do. *The more I think about it, the more I think I need to reassess Kimikiss Pure Rouge. For some reason, I keep coming back to watch the Mao scenes. 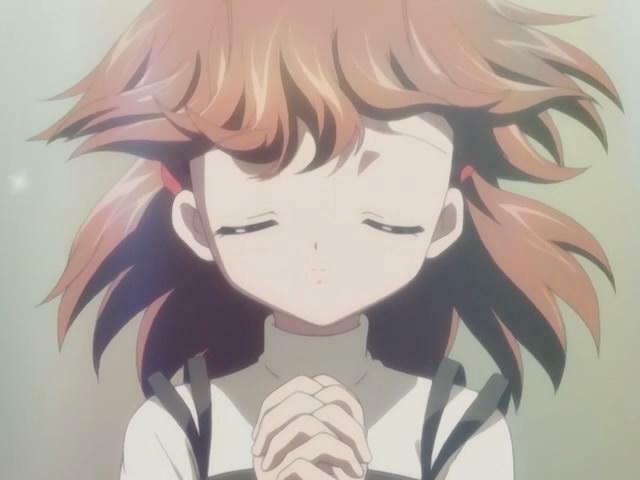 Expect a full reconsideration when episode 2 is released in English. 75% recommended for your anime diet. But go watch episode 1 first! These characters do seem to have more depth then those in Kanon. Other than Nayuki, who was good at running, those girls did not seem to have real hobbies beyond their individual food obsessions. Here you at least have other interests: drama club, textbook study, and whittling (or whatever that was). And this series somewhat corrects the absence of well-rounded family groups in Kanon (besides Nayuki’s mother and Shiori’s sister). 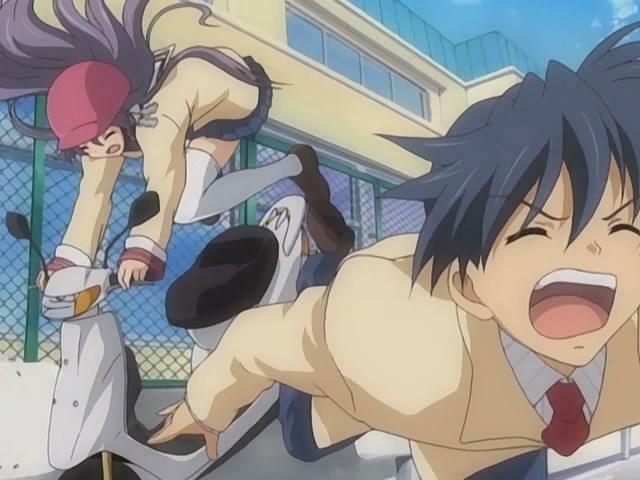 School Days will forever change the way we look at harem anime from now on, I think. LOL. 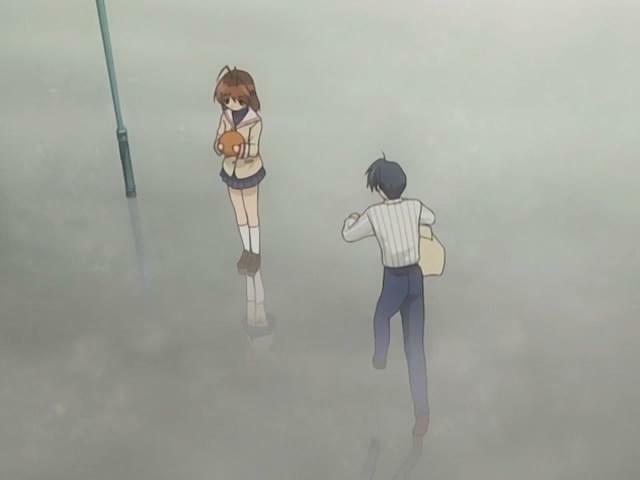 As of episode 2, Mike, I’m very into Clannad already, and I share your thoughts on the matter. 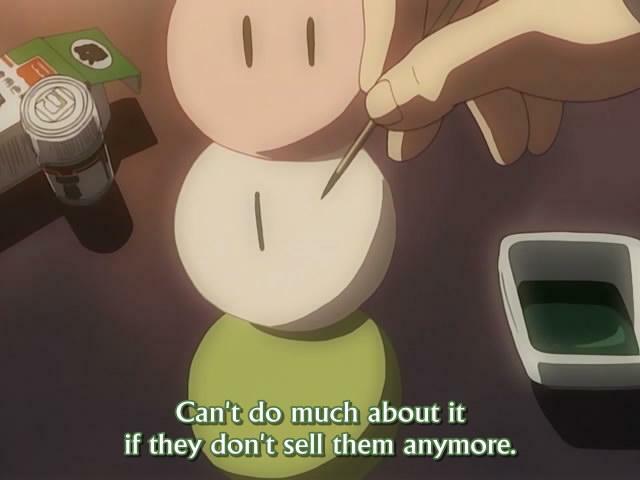 Nagisa is more than just Key holding up a generic moe puppet and going “here is a sad girl, you must love her otherwise you are a heartless monster”; ditto Kyou and Tomoyo so far. While Kotomi and Fuuko have yet to manifest other sides to their character as of now, what’s been revealed so far is promising, and I love it. 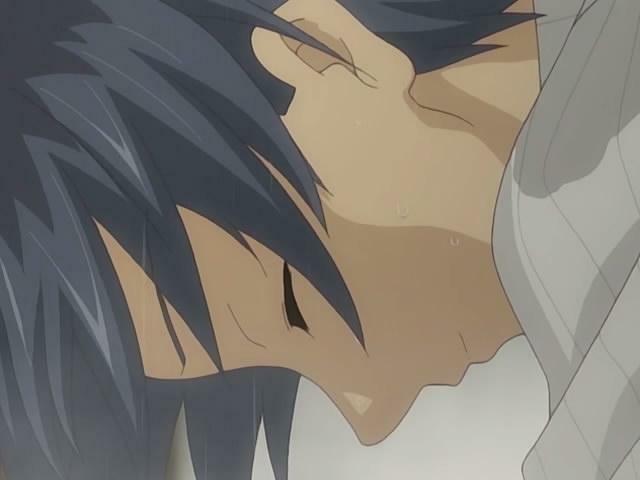 Since the realism part’s been all but settled right now, I guess the make or break would be the depth in which Tomoya’s going to be involved with each girl. These aren’t retarded moe harem cows we’re dealing with here, these are what seems like girls with distinct, individual personalities — will they be all conveniently ignorant of each other’s existence when it comes to a relationship with Tomoya? I’m eagerly anticipating it. 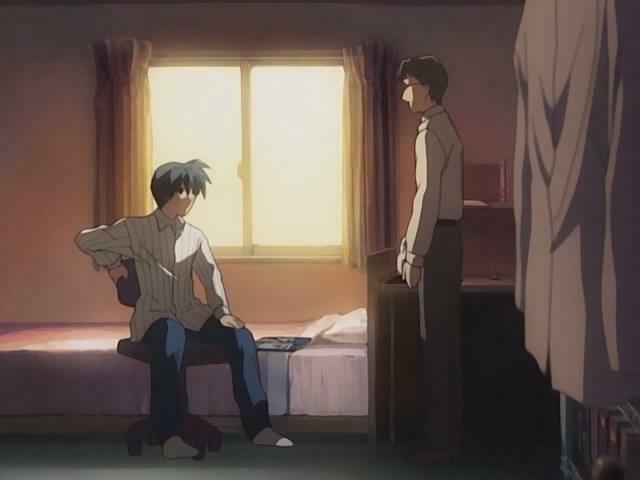 Also, in praise of its direction so far, they seem to be subtly hinting that Kyou might be the first arc. Notice how Ryou said that Tomoya would meet a girl in a romantic situation (well, somewhat, I guess, given how “almost getting run over by bike” and “encounter with feisty babe” cancel each other out) that would make him late for school etc. If my prediction is true then… wow. Just wow.